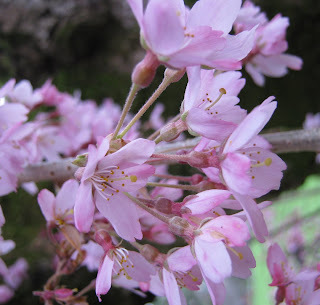 My soul has been reluctant to let go of the slow rhythm and interiority of the dark winter days yet it is impossible to deny that spring has indeed arrived early in the Pacific Northwest. Unlike the copious amounts of snow that our brothers and sisters on the East coast have endured, our winter weather has been very mild. 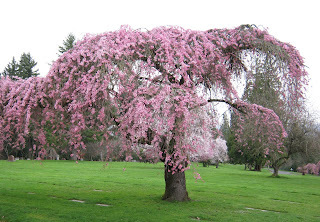 Blooming earlier than normal, I took these Cherry Tree photos in the cemetery today near my home/studio where I walk almost daily. They are so gorgeous and with the abundant birdsong, I was overwhelmed by the awe and wonder of creation. Over the years, I have come to know this cemetery well (new arrivals or new statues, headstones, flowers, and landscaping) as I walk among the remains of those who have gone before us, often prematurely. People sometimes find it odd that I walk amidst the dead, but for me it is a reminder of the fragility of life which encourages me to appreciate life more fully, to follow my soul’s calling both creatively and spiritually, and to not take this brief time I/we have on this beautiful planet for granted. Sadly, we need look no further than Haiti and Chile to remember that truth. On a personal level, I’ve written about my own losses here so this isn’t new territory but at times—especially during this epoch period of transformation and suffering for so many around the globe—it can be easy to slip into fear of the unknown or the future, so these walking meditations are a way for me to practice being more present to life, beauty, love, and gratitude. What brings you more fully alive? Feel free to share your thoughts or feelings around this. It has been another month since my last post here. I am just now getting psychically grounded after I was rear-ended at a traffic light on the 26th of last month. Like most of us, I was simply going about my life. In this particular case, I was heading to the market for a loaf of bread to go with my mother’s ‘famous’ spaghetti which had been simmering all afternoon in preparation for dinner with a dear friend that evening. It was raining and dark, but I was was feeling very alive and joyous, singing, when my car was suddenly struck with great force from behind. I have been in a few small fender benders in my life, but for some reason this particular accident struck a deep cord in me. The accident literally stopped me in my tracks and I have been sitting with the notion of impermanence more attentively these days. I have been a student of Buddhism for many years, both in my meditation practice and as a framework in which to encounter life. Certainly the teachings around suffering—the First Noble Truth being that suffering exists—offered me great insight and comfort when I was in a very dark night of the soul twenty years ago after the deaths of my mother and brother (among others at the time). But it has been twenty years since I have experienced the death of someone close to me except several of my beloved four-leggeds. Like all of us, I have had my share of disappointments—loss of friendships and lovers, but no physical deaths close to my heart. I seem overdue somehow. On a smaller scale however, my accident—which totaled my car and left me with some neck injuries—was also another reminder for me of my mortality and how quickly life changes. Change. Impermanence. The cycle of life, like the cycles of nature. I wonder, do we need these traumas, small and large, in order to remember how precious every moment is when we get too complacent about life? I believe there is some truth to this (and wrote about this in my master’s thesis) because these experiences often bring us more fully into the present moment and closer to Spirit, or God. “The wailing of the broken heart is the doorway to God.” —Rumi (Trans: Coleman Barks). Last night, we held a sweat lodge ceremony at my spiritual community for one of our members who is journeying through a dark night of the soul after a series of familial deaths. There amidst the darkness, in the womb of Mother Earth, we each spoke of our grief and loss—both recent and distant—as well as the darkness that comes before the light and the gifts that grow out of our suffering (however long that process takes). We remember that we are grieving because we dared to love so much. It was beautiful, healing, and an honor to bear witness to the deep sharing from the heart. So, it is with humble gratitude that I allow myself to be a messenger for spirit to work through me in order that I might create art/beauty that moves the heart. I don’t normally show my work until it is complete but several people have asked me about my process lately, so I wanted to post these photos from my studio. 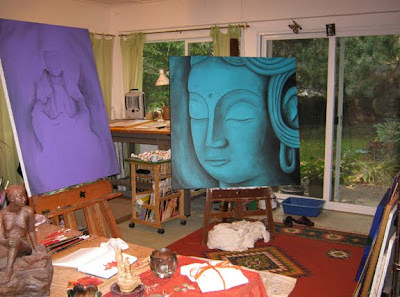 The teal Buddha is complete as you can see on my web site and waiting for its owner to take possession. 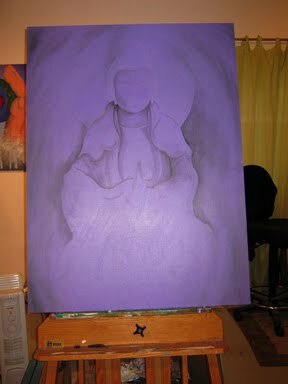 Inspired by my process in creating the Buddha, the feminine face of the Buddhist tradition asked to be revealed as well, so Kuan Yin or the Goddess of Compassion (She Who Hears the Cries of the World) called out to me. I am answering that call. In closing, from Spiritual Artist, Alex Grey’s book, Art Psalms. Life is always lived at risk. Follow the courage of your highest dreams.